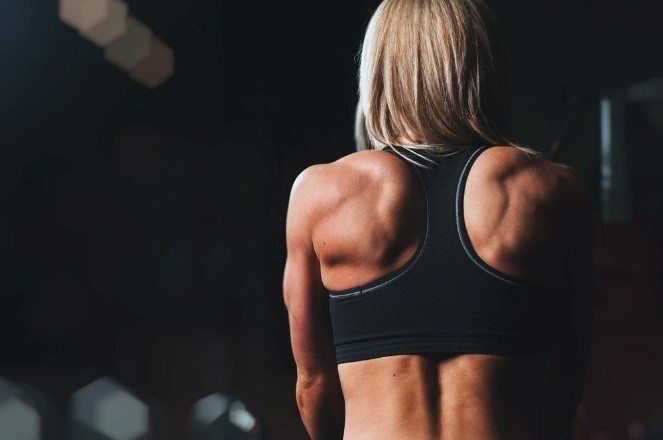 A 41 year-old female recently consulted our office for lingering lower back pain that had started “for no reason.” As a mom with three kids, she liked to exercise to stay fit and relieve stress. She was a self-described “social runner” who ran 3-4 miles a week with her friends. Unfortunately, because her low back pain continued to linger, she was unable to run for exercise anymore. She had first consulted her family physician a week or so after the pain started. Her medical doctor diagnosed the condition as a back strain, and prescribed pain medication along with some simple low back stretches. However, the low back pain kept recurring, so on the recommendation of a couple of her friends, the patient decided to try chiropractic care for the first time. The patient rated the intensity of their pain/symptoms as an 6 on a scale of zero to 10 with zero being complete absence of symptoms and 10 being very severe or unbearable. The patient described her pain with the following qualifiers: aching and throbbing. Upon questioning, she related that the symptoms were aggravated by activities involving lifting, twisting, bending, and running. The patient stated that some relief was obtained when she did not run, and ibuprofen was taken. Muscle spasm associated with segmental and somatic dysfunction of lumbar spine and sacral regions causing acute lower back pain. Pain for more than 8 days. Moist heat was applied to reduce the muscle spasm, followed by Activator-assisted chiropractic manipulative therapy to the lumbar spine and sacrum to restore normal joint function / muscle balance, and also to reduce pain and inflammation. After two (2) treatment sessions in the first week, the patient reported that she felt 50% better. On her third visit a week later, she was given a specific side-bridging exercise to do at home to help stabilize her lower back, instructed to resume running, and to follow-up in one week. On fourth follow-up visit at two weeks, the patient had resumed normal exercise activity, and the joint dysfunction that had been causing her lingering lower back pain was resolved. While individual results may vary, this case is a good example of what many first time chiropractic patients experience in our office. This patient had previous episodes of lower back pain, but the pain always went away on it’s own. This time was different because the pain had lasted for almost a month by the time she consulted with us. And, her lower back pain was interfering with her ability to run for exercise like she enjoyed doing. All of this made her an ideal candidate for chiropractic care. Keep in mind that one reason this patient responded so well is that she exercised regularly. People who stay physically active tend to respond better to chiropractic care. If you would like find out whether Activator-assisted chiropractic manipulative therapy may help you, call or contact our office today.